The Pittsburgh Steelers had high hopes for Martavis Bryant at one time. But after a pair of suspensions and some ‘trade’ drama last season, they decided that enough was enough. So, they shipped him off to the Oakland Raiders for a third-round draft pick. New head coach Jon Gruden was more than happy to take him off the hands of the Steelers. Sounds great, right? Well—as it turns out, it appears that Gruden and the Raiders may have caught him at the wrong time. According to several news reports, it sounds like Bryant could be facing another suspension. The Raiders are supposedly waiting on the ‘final word’ from the league office. Bryant has served two suspensions already during his short career; once in 2015 for four games and again in 2016. But in ’16 it was for the entire season. Chances are, he could be facing another lengthy suspension if he did indeed violate the policy once again. As crazy as it sounds, a longer suspension may be better for Bryant. Since he missed the 2016 season serving his last suspension, he did accrue a year of service. That means he is still playing under his rookie contract. After a so-so return to action last season (50 receptions, 603 yards, three touchdowns), he really needed to have a good, 16-game season this year. He needed to give teams a reason to want him when he becomes a free agent. Should he get hit with a four or ten game suspension, he will still accrue a year of service and become a free agent. For his agent to get him much more than a low-ball offer, the 6-12 games he does play better be fantastic games. But in Oakland’s offense, that could be easier said than done. Odds are, the Raiders are going to throw the ball a lot next season unless Marshawn Lynch can find the fountain of youth and Doug Martin can find his game again. While that should be a good thing as far as Bryant is concerned, any absence will hurt him and make it a bad thing. Whether he’s out for four games or ten, he is going to miss some valuable game time with his new quarterback, Derek Carr. 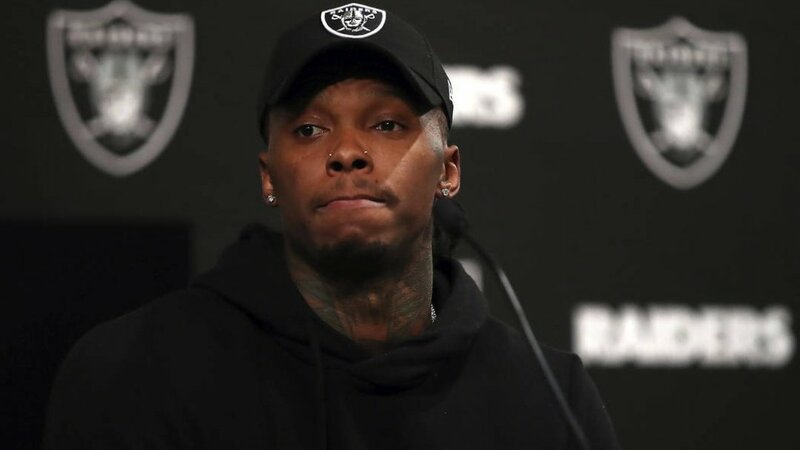 He’ll have the preseason to work on his connection and timing with Carr but preseason work alone will not establish the connection he needs to develop with his new quarterback. That develops over time; time he may not have if the rumor mill is right and he gets suspended. Since Carr will already have a good connection with Calvin Ridley and Jordy Nelson, Bryant may find himself on the outside looking in– again. To be fair, the NFL isn’t talking. So, we don’t know for certain that he did indeed fail a test again or not. All the drama could be for nothing– or it could be the premature end of a once promising career. Guys who get suspended for repeated drug offenses usually don’t get jobs (there are a few exceptions, of course). No one wants to pay a guy they can’t trust will be available to play.